Researching ports of call and finding the best excursions for you can save quite a bit of money and time in port. However, booking excursions on your own can be daunting if you are unsure of what to look for. Here is a walk through of how we navigated the ports on our last cruise, and the pros and cons of each. The Norwegian Getaway cruises out of Miami, and our run was a fairly standard Caribbean itinerary. With a sea day as the first and last days of the cruise, we really appreciated the ability to ease our way into relaxation and then ease our way back into the thought of the real world. The ship is big enough to keep everyone entertained while at sea, and visited enough ports to feel like you weren’t trapped onboard. This is honestly one of our favorite ports, though we may not have fully appreciated it at other points in our lives. 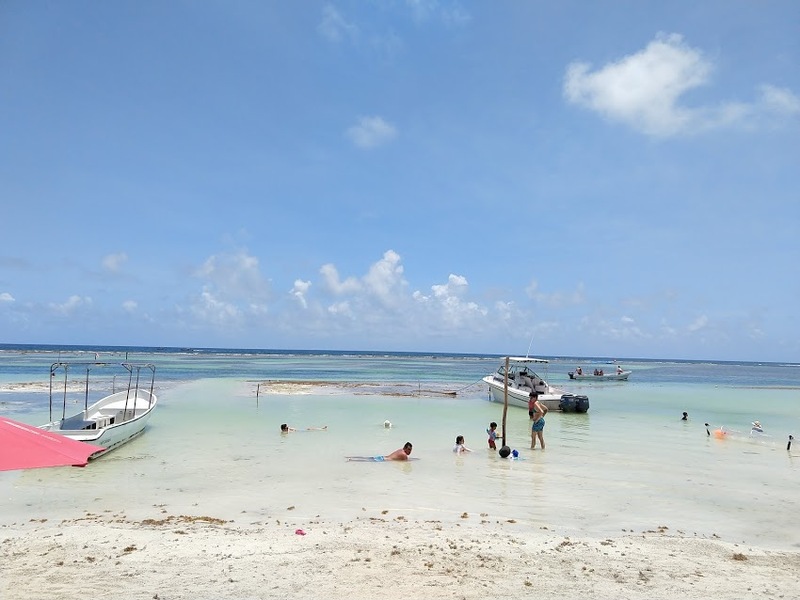 Of course, you can take amazing adventurous excursions to Mayan ruins or jungle expeditions, but if you have kids (and even if you don’t) I would highly recommend spending the day in Mahahual. The main town strip and beach area is a quick 5 min taxi ($6 for three of us) or 10 minute shuttle ($3 pp and kids under 4 are free) from the pier and really easy to get to. While neither need reservations, the shuttle seems to be a new institution to keep the money in the port so the taxis now wait outside of the cruise terminal. Once you arrive, the experience is slightly different depending on your mode of transport. The shuttle will deposit you into the hands of touts leading you to a specific beach, and the taxi will let you off anywhere you want. 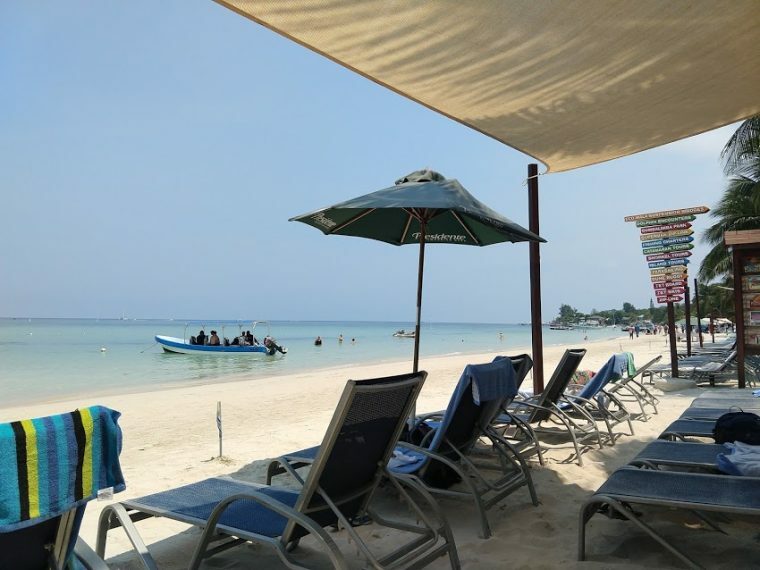 It doesn’t really make a big difference as long as you are decisive about whether you want to head immediately to $1 beers from the touts or continue walking along the beach as we did. The fact that we saw the fellow cruisers that had followed the touts elsewhere later on indicates that maybe that wasn’t their best choice. We were in Mahahual about a year ago with our son and did our best to recreate the experience. Enjoying fresh cevice from a shaded palapa while the little ones play in the calm ocean water (thanks to a very gradual drop off in depth) is a close to relaxed as I can get with a three-year-old. Many vendors will comp the chair if you buy food, so negotiate this in advance. It seems that locals enjoy visiting Mahahual also, and both our recent experiences resulted in our son ingratiating himself into a Mexican family with cute new siblings. Total spent: $35 for 3 including food, drinks, palapa, and transportation to/from. I love it here. Pros: Amazing food, sand, sun, and company. Cons: You may have to haggle a bit to get what you want. 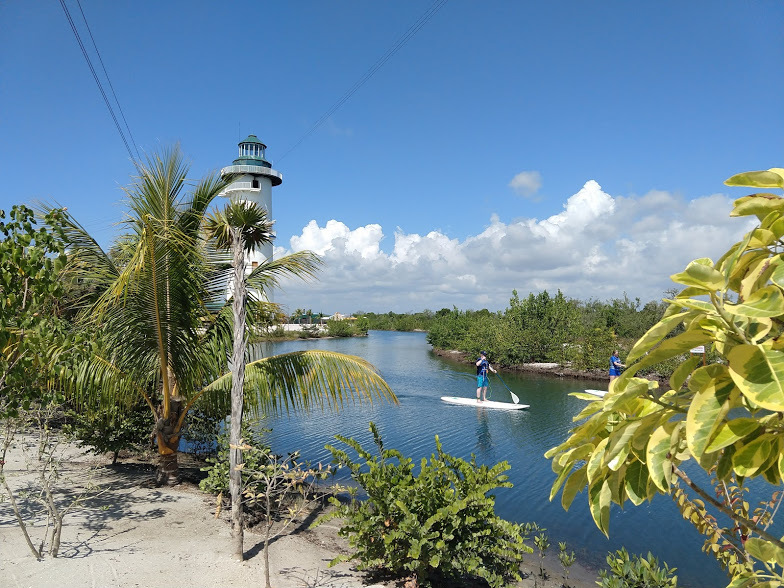 Stand up Paddleboard in the salt water lagoon, Harvest Caye. This was actually our first time to the NCL private island and I usually hesitate to spend money in setups like this because I am not sure who is actually profiting from it. The cruise excursion options didn’t offer any value or rarity of experience here as opposed to other locations, and I would rather pay locals than the cruise line. Therefore, we enjoyed another day at the beach, watching the zipliners and stand-up paddlers make their way around us. There is a pretty great water playground for kids, but it was extremely hot and the ocean is significantly rougher and deeper than in Costa Maya. A half-day was enough for us before we returned to the ship, which docks instead of tenders, making it a quick walk back for lunch. Total spent: $0. Pros: We could play the day by ear, casually exploring until we were ready to return to the ship. Cons: Not the most exciting day, and you area captive audience for most purchases. Coxen Hole Pier lines up many vendors immediately outside the ship, offering basically the same excursions as you would get on the ship but for much cheaper. We spoke to a vendor and a taxi driver to compare notes on price, duration and availability of a private tour. Preliminary research led me to Gumbalimba as our activity for the day, with a stop at West Bay Beach after the park. The price quote from the vendor and the taxi driver ended up at $40 for transportation to/from Gumbalimba (approx 30 min each way), with an additional $30 for entry to Gumbalimba park itself (Kids under 4 are free). This included a private guide through the park, interactions with macaws and macaques, and a visit to the insectarium. The beach had an additional entry fee ($10 per adult) which provided a shaded chair. Added bonus of booking our own trip: The pace was whatever we wanted it to be. Our taxi driver waited in the parking lot for us (despite what vendors say, this is possible) and we went directly to the beach following our stay at Gumbalimba. Also, our driver spoke limited English but found it endlessly amusing to allow my son to practice his 3-year-old Spanish with him. This provided a super sweet, human to human moment that can be hard to find when stuffed into a bus with 40 other cruise passengers. Total spend: $120 plus tips and beverages. Pros: More personal experience at the park, more authentic interactions, Pacing tailored to our needs. Cons: Wondering if/when additional fees would spring up. Luckily, none did. Again, there are myriad ruins that would easily fill your day docked in Cozumel. We have visited many of these previously, and while they are fascinating, many offer little to no shade and can be a long day for little ones. 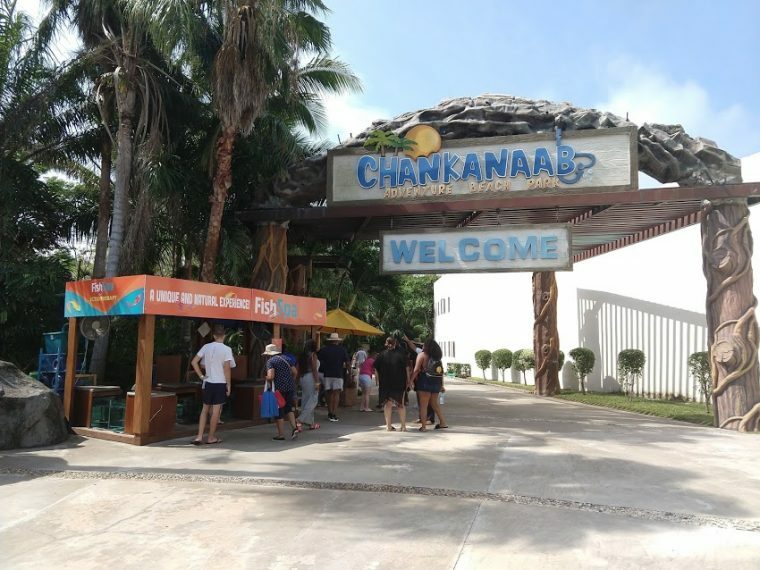 We opted to go to Chakanaab Adventure Park, about a 20 minute taxi ride from Punta Langosta terminal (~$12 each way). I pre-purchased tickets online ($21 per adult and free under 4) which included beach and pool access, Sea Lion encounters, a sad looking crocodile exhibit, and cultural gardens with Mayan artifacts. There are other add-on options such as Dolphin encounter and manatee interactions, but we stuck to the basic package. The beach area has a rocky drop-off where you can snorkel, but the water is too choppy for inexperienced swimmers. We spent most of the time in the shallower swimming area which felt safer but was much more crowded. Overall, this park provides a nice half-day of varied activities, at which point you can return to the strip for food or shopping. Lunch was the highlight of our day- Cuatro Tacos served up a sampler of eight different taco variations that rivaled all others in recent memory. Total spend: $66 for the park portion, ~$30 for A LOT of tacos. Pros: Relatively cheap and on your own timeline. Can stay as long as you want in order to accommodate other activities in town. Cons: Feels touristy, but so are many of your other options. 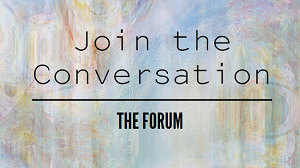 1) Think about what kind of experience you are looking for in each port as well as a “flow” across your vacation. 2) Do your research to understand availability, duration, pricing. 3) Look up reviews of vendors to determine credibility. 4) Assess your options to decide if you would like to book in advance, or if you are willing to play it by ear once your arrive. We just made a couple of these stops too. Next time you’re in Cozumel check out Paradise beach. It is fantastic for families. $21/pp gets you a “fun pass” that includes water obstacles (slides, climbing walls, trampolines), kayaks, paddle boards, a beach lounger, and snorkel gear (though the snorkeling here is weak). Food and drinks are extra but were excellent and service was off the charts. They also have jet skis to rent and banana boat rides if you like. Kids 5 and under are free! If you’re ever in Mahahual again I highly recommend taking a snorkel tour out to the reef. Tons of fish and we lost count of the number of sea turtles we encountered. Awesome tips, thanks for sharing! I love Mexico so much and hope to be back soon! I used to book the excursions with the cruise line. Then we had an absolutely horrible experience in Mexico. Broke down transport, ATV broke down and the tour operator said Royal Caribbean would handle getting us all a refund. Most didn’t bother to complain, we did. They offered us 20% back. Nothing more. Nobody cared, knew we couldn’t do anything. Complained via the BBB, no help. I can’t recall the government agency in Florida that oversees cruise lines, but even a request from them did nothing. So, we book on our own now. Is there a way to have continuing queries for Airlines not covered by Expert Flyer, like JAL? My fortunate situation of having many points and miles, plus a decent amount of cash, have led me to offer my niece and her fiancé airfare to and from Asia as a wedding present. What are the logistics of booking a trip for others? With money or miles does it differ? Hyatt Explorist worth the trouble?